What inspire you to pursue a career in marine technologies? In the mid 90‘ I started my studies of civil engineering at the University of Rostock and at the same time I started working on sailing ships. In the course of several youth projects I went sailing in the Baltic and North Sea as well as the Atlantic and the Mediterranean. I learned about the interactions of the elements that pushed the ship, but also defined its limits. Sailing on was only possible in harmony with the wind and waves; fighting was useless. I finished my studies with a diploma in water/hydraulic engineering with a focus on forces of nature and their impact on coastal areas. Having spending most of my life sailing at sea, I decided to study maritime science in Warnemünde. By the end of my studies I received a job offer from the German Research Icebreaker POLARSTERN. I was the first female navigator on board participating in expeditions to the Arctic and the Antarctic. The untouched beauty of the ice was deeply impressing and I realized the sensitiveness of its ecosystems. What are the main things you enjoy about being a marine scientist/engineer? To be surrounded by interesting people and to be informed about up-to-date research enriches me personally and makes my job unique. What are your main professional achievements? Any/what obstacles? I currently work on a temporary contract as the Chief Officer on board the German Research Ship METEOR. We try to provide the optimal conditions for research activities on board. Moving always forward, we try to solve problems creatively and generate new solutions. This makes the job challenging yet really interesting and inspiring. Did you have any role models that led you to this career? How did they influence you? I did not have any role models, nobody in my family worked at sea. I never worried about my later working environment. I just wanted to go and work on board with no ifs and buts. On board, I try to reflect on my respective supervisor and analyze his/her courses of action to develop my own leadership style. Unfortunately there are only a few exemplary female figures that promote women’s access to the seafaring professions. I am very thankful for the surroundings in which I grew up. There were no “traditional” views on how professions should be divided between men or women. Have you ever had any difficulties in your career due to your gender? If yes, how did you handle them? Looking back on my fields of study, beginning with my A level majors at school and continuing with my studies of civil engineering and maritime, there were often more men than women. Still, I was able to mostly advance without any constraints. The first time I realized any limitations was during my first internship on board. As a women I was constantly in the focus, especially when crewmen with a different cultural background were present. For the next internship I applied at a shipping company, the crew of which was used to working with seafaring women. My training was very important to me and so some stays on board became a tough struggle. I often had to be better than my male colleagues are and also to pave the way to a modern perception of women in seafaring professions. Nonetheless there were also great moments and people, who stood up for me and supported my career. Do you think there is a need for special girls’ support to study marine sciences/technologies? I’m not sure if it might be more important to support young females or to establish programmes for structural changes that lead to redefining the existing system. How could they be encouraged to pursue careers in marine sciences and technology? In my professional environment, I only had male supervisors who decided about my career. I would highly appreciate strong interdisciplinary female networks that support women in exchanging their experiences and finding new approaches. You should always follow your own way and study the topic you are interested in. Otherwise if you have a clear idea of how you want to live, choose the appropriate profession, irrespective of any doubts from outside. 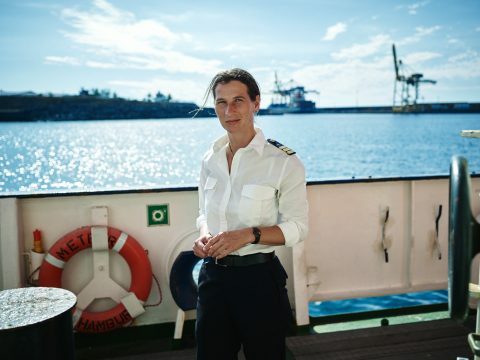 I wish to fulfill my dream of being a Captain on a German research ship and to see a change in recruiting so that more women find their way to a seafaring profession, whether a female crew member, a scientist or a chief scientist. Can´t wait to sail with the first female captain. You will make it happen.